This adorable wreath was designed and crafted by Pauline "Polygonmad" McHaffie. The minute I saw this photo, I asked Poly if I could share it with you. I love it! With hanger, cut the top curve off, open until almost straight. Take green material; fold in half, right sides togehter, lengthwise. Glue or sew along thelong edge, to form a tube. Turn to right side. Put wire in tube, form a circle. Fasten ends, then draw the material over and glue, to complete the tube. Gather the material on the inside edge of wreath, by sewing a running stich all around. This will tightn the material, and make it a flat surface to glue on. Fold Teri-cloth, right sides together, matching selvedged edges. Cut two squares, approximately 8". Draw an "S" shape, (see photo). Cut out pattern pieces. Stitch around entire edge of "S" shape. Using photo as a guide, cut a diagonal slit through one layer only. Turn to the right side. Tie ribbon around "neck" area. Glue buttons for eyes and nose, and a pompom tail. 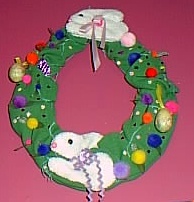 Position bunnies on wreath, as desired. Glue in place. Glue pompoms, silk leaves, stick on earrings and plastic eggs, as desired. 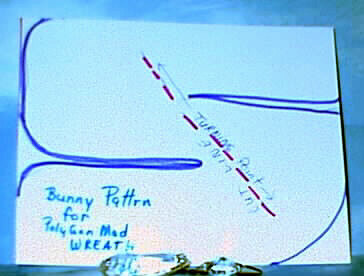 This is Polly's pattern for the bunnies. Thank you Polly for once again sharing your crafting talents with us!